I’m teaching OpenStreetMap 101 at the first MaptimeCHI. Architects will learn that OpenStreetMap can be used as a data source when developing projects and as a basis for designing custom maps in project publications (website, anthology, monograph, client presentations). This meeting is about getting an introduction to OpenStreetMap and learning to make your first edit in the “Wikipedia of maps”. Here are two examples of how architects could use OpenStreetMap data. Example 1 of how to use OpenStreetMap. Instead of publishing a screenshot of Google Maps in your documents or website, create a custom design map like this without having to spend so much time tweaking it in Illustrator. This map was created by Stamen Design using TileMill. Here’s one example where OpenStreetMap could be useful. Let’s say you’re working on a site plan for Willow Creek Church in South Barrington and you need a general layout of the parking lot. 1. You can get it from OpenStreetMap because it’s already there. 2. You can draw it in OpenStreetMap yourself (to benefit all other OSM users) and then extract it as a shapefile. 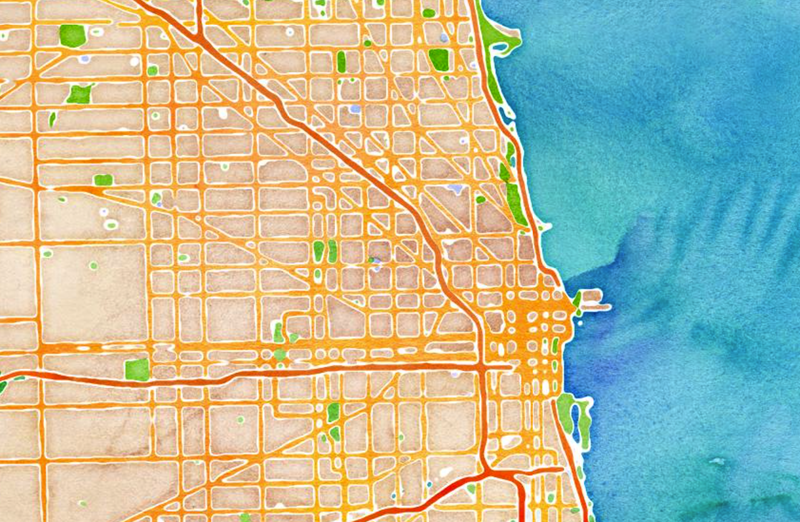 Maptime is time for mapmaking and it’s taking the country by storm. Only reviews left for the current version are displayed on the iTunes Preview page, and the default view of the iTunes Store. I’m appreciative of the two reviews people have left for my app – it’s a bike map for Chicago stored in your phone, download in iTunes. Their positivity and the slight increase in sales this past week has increased the ranking of my app. I don’t know what the ranking means. [In addition to the number of downloads, other] factors play into the ranking equation such as how long the app is opened as the active app and how often the app is opened. Saw this app being discussed on Twitter and thought I’d check it out. So, on the hottest day of 2012, I jumped on my bike and rode around my area checking out the apps features. Color me impressed! I rode to a few areas that I was not over familiar with and activated the app to peruse my options via my bike (or CTA). I look forward to using this on my far south/far north bikiing adventures soon! Describe what is good about the app, and what you like about the app. Describe how you’ve used the app. Suggest ways the app could improve. This was what the first version looked like. It wasn’t very good. This guy showed up. Why didn’t you? I’ve struggled inviting friends and peers to the Streets for Cycling Plan 2020 public meetings and open houses. A couple of said something along the lines of “I don’t need to go if you’re going”. My job is to tell you what happened. But you have to show up. You have to increase the numbers of people who are demanding changed streets. I am one person, with a blog. When I put my name on the sign-in sheet, or leave a comment, I am only signing my own name, not the names of my blog’s readers, or my friends and neighbors. There are 4 more meetings. The draft network will be presented there. This is basically your last chance to affect what the final plan will say. What kinds of things will it say? It will make recommendations as to which type of bikeways will go where. Want a protected bike lane and road diet on Chicago Avenue, because there’s so much retail and services you want to visit, but people are driving too fast? Yeah, go to the meeting and make sure it’s on there. These people showed up. Were you there? Photos are from the Sulzer Library event on February 1, 2012. The train is entering the crossing. If you weren’t aware, Chicago has a ridiculous number of trains passing through here. We’ve been the freight train capital of the country for over 100 years (I’m not going to verify this). And apparently it takes a train the same amount of time to pass through Chicago as it takes to travel from here to Los Angeles. One of the interesting places they pass through in Chicago is at Ping Tom Park, in Chinatown, on the Chicago River at 18th Street. A double track part of the CN line borders the park on the east, separating the park from rowhouses in Chinatown. The Chicago Transit Authority’s Orange Line elevated viaduct shares the right of way. I was showing the park to some visitors from Spain after we ate at Joy Yee Noodles (2159 S China Place)*. The at-grade crossing bells starting to ring, and the red lights started to flash. Then the gates came down. We were trapped! That’s the neat thing about the freight railroad here and the park: there’s a single entrance that’s blocked by a train. And this one was long. A pagoda in Ping Tom Park. Here’s another view of the pagoda where you can also clearly see the Orange Line viaduct. As we just arrived, we weren’t interested in leaving. We explored the new north section of the park. This outing gave me several opportunities to test out the capabilities of my new camera, a Panasonic GH1, and accompanying lens, a LUMIX G 20/f1.7mm (that means it’s fairly wide angle and has an enormous aperture)**. It takes great photos in the dark without a flash. I was photographing the train, using the “panning” technique – this means you set the focus beforehand and then move (pan) the camera with the object to ensure it appears in focus in the resulting image. I succeeded with 50% of the photos; my issue was choosing the right speed at which to pan the camera. This photo is one of the better panning shots I created. The train, as many Illinois railfans probably expect, was carrying ethanol and empty flatbed cars, but also some hydrochloric acid. I’m going to guess some of the tankers were filled with America’s favorite artificial sugar: high-fructose corn syrup. * There are two Joy Yee Noodles restaurants in the same Chinatown Square shopping center. They are of the same company. ** I bought the body from a friend and I bought the lens separately. I paid more for the lens than the body. I thanked him for reading. I like it when people tell me they read that blog and they appreciate what John Greenfield and I are writing. It definitely lets you know that (in addition to the comments that people leave) that the work we’re doing is important. Anyway, I never know what to say to people who let me know they read Grid Chicago. I used to ask what their favorite article is and no one seemed to know how to respond so I stopped asking. To this reader, I asked, “Do you comment?” Also a lame question. This photo of a bus with double articulation has nothing to do with this post. I didn’t have a relevant photo ready to go. A year ago during Christmas, New Year’s, and today, I was on my 18-day trip through Europe. To share that trip (again), I’ve been uploading more photos from the trip to my Flickr. I’ll double the number uploaded in a couple of days. A year ago on January 3rd, I traveled from Bremen to Wuppertal, Germany, and then to Amsterdam, Netherlands, with train transfers in Venlo (at the border) and Eindhoven. I added a bunch of new photos from Italy, mostly from the mountain bike ride I took in Como and Brunate with my friend’s brother. This was December 27, 2010. Matteo and I on a mountain above Lake Como and very near the border with Switzerland on Monte Boletto. View on OpenStreetMap. A panoramic view of Lake Como and central Como. Brunate is a village on top of the mountain in the middle. We took the funicular up there. I also uploaded new photos of Bremen, Germany. I added many more pictures of the Valentin submarine pens, the ferry ride across the Weser River into Vegesack, and the trams that run constantly 24/7. The tram station in front of the Bremen Haupthbahnhof (central station). Notice how familiar the people are with walking near and around the trams. View this on OpenStreetMap. This was January 1, 2011. What the submarine pen looks like from the land side, south of it. Read more about these storage facilities of Nazi submarines. This was January 2, 2011. From the Weser River ferry into Vegesack I saw this enormous shipbuilding facility with a yacht parked out front. It appears comparable in size to the submarine pen. This was January 2, 2011. The list above contains the dates for which I uploaded many photos recently. Here’s the full set of photos and here’s a collection of the different topics. This is part of a series of articles on the issue of lifting the pedestrian street designation on a part of Milwaukee Avenue in Logan Square so that the McDonald’s franchise owner can demolish the building, build a new building, and build a double order point (“tandem”) drive through. Read the first post. At the hearing on December 13, 2011, Alderman Reilly asked if there was evidence of injuries or crashes due to the drive through. No one brought this data to the hearing. I cannot directly attribute the crashes to the existence of the drive through (unless I had the original crash reports), the drive through probably generates traffic that would not be there without the drive through, and it causes people to have to turn across a lane of traffic, either to enter the driveway on Milwaukee, or when exiting the driveway onto Sawyer, or when turning onto Milwaukee from Sawyer. I am looking for studies that research the impacts of drive throughs at fast food restaurants and pharmacies. 37 people were involved in 13 crashes within 100 feet of the center of the McDonald’s driveway from 2007-2010. Seven people were injured, one was a pedestrian. Double the search radius to 200 feet and we see 87 people involved in 35 crashes. Now, four pedestrians and cyclist were injured in addition to the 10 drivers and passengers injured. Download the data in this map. View a larger map. Hello, my name is Steven Vance. I work as a consultant and writer on sustainable transportation advocacy and planning projects. The text amendment to modify the pedestrian street designation may negatively impact the continuity and safety in traffic of all modes along Milwaukee Avenue, which happens to be the city’s most popular bike route. I ask that McDonald’s provide a traffic impact study before this matter is discussed further. Lynn, a Logan Square neighbor, describes more of what happened at the hearing, as well as the next step at the Zoning Board of Appeals. Here’s a map of all pedestrian streets in Chicago. View larger map. Download a KML file of all the pedestrian streets. Download the shapefile of all the pedestrian streets. Thank you to Azad Amir-Ghassemi and Bill Vassilakis for their help in digitizing the table of pedestrian streets in the zoning code. Crash data from the Illinois Department of Transportation show several crashes along Milwaukee Avenue from 2005 to 2011. If this location hadn’t been removed from the P-Street ordinance, McDonald’s would have been required to install both the drive-thru’s entrance and exit on Sawyer, where there is markedly less traffic than on Milwaukee (or not build them at all). This project has not only allowed a documented hazard to persist (despite the P-Street designation), but perhaps to be worsened. From 2005-2011, there were 3 bike-automobile crashes and 5 pedestrian-automobile crashes within 200 feet of the drive-thru entrance, which includes the intersection of Sawyer and Milwaukee (where many people will drive back onto Milwaukee from the drive-thru exit). There were 82 car-car crashes in the same period. At a nearby intersection, Milwaukee/Dawson, an intersection with a similar retail makeup and traffic count, shows about half the number of crashes. I took this photo for several reasons: to show a sidewalk reconstruction project that forces people to walk in the street; to show that people bicycling will advance from where I took this photo to the location across Grand Avenue to get a “head start” on cycling across Halsted Street to Milwaukee Avenue. There are lots of things that we want to change. Keeping track of what they are can help focus energy on making that change happen. (That’s why I carry my camera with me at all times outside my home.) One way I’ve started to document and share is by writing about the good and “needs improvement” parts of Chicago transportation on my new blog, Grid Chicago. If you cycle in Chicago, I implore you to attend the Streets for Cycling planning meetings – the first one is December 10th – so you can express your concerns and desires. There are one hundred other ways to be involved in supporting a change in Chicago, and I might be able to link you one you’re interested in. Note: The CTA has started several online efforts to collect feedback from and communicate with customers, but they’ve always collected feedback through their email address, feedback@transitchicago.com, where they always respond. These new efforts are Facebook, Budget Ideas, and Twitter. Another person bicycles across Grand Avenue to get that head start. *These are all things I do, but I encourage everyone to think creatively and do what interests them.